My first season as a baseball player at The Citadel, I was an ineligible redshirt Junior. I had transferred to The Citadel after two years at Erskine College, which at the time, was a small NAIA school (500 students) in South Carolina. By NCAA rule, I had to sit out for a year. I could practice with the team, but could not play in the games. Lots of naysayers said I was crazy for making the switch. I was a two-year starter at shortstop at Erskine, but I wanted a new challenge. Coaches and friends said I was making a huge mistake — that I would never be good enough to play Division 1 baseball. Others just thought it was insane to submit yourself to the rigors, discipline and overall inconvenience of a military academy when you could be partying it up anywhere else. My best friend in high school was Tim Jones. We had played on the same teams since the 9th grade, and over a four-year high school and American Legion career, Tim and I forged a bond that has lasted a lifetime. During our final American Legion season The Citadel’s ABCA Hall Of Fame Coach, Chal Port was in the stands on a recruiting visit. With the misguided confidence of an 18-year-old, I assumed he was there to watch me, but after the game, he offered my friend Tim a scholarship to play Division 1 College Baseball at The Military College of South Carolina. I couldn’t have been happier for him. As my final summer of American Legion baseball came to an end, I accepted a partial academic scholarship to Erskine where I later made the team as a walk-on. During the first six games of the season, I sat the bench, but then when our senior shortstop injured his wrist, I was thrust into the lineup. I ended up batting .311, and we finished the year 13-13 (yes, we only played 26 games), and even though some would have considered that a good start to a college career, I was disappointed. Our practices were disorganized and usually consisted of a round of in and out and a 12-15 swing round of BP. I didn’t feel I was growing as a player. Meanwhile, my buddy Tim was thriving under Coach Port’s player development program. Halfway through his freshman season, he had earned the starting spot at second base and batted over .300 for a 40-win team that won the Southern Conference and showed well in a regional. He told me about The Citadel’s hyper-organized practices and he shared all the weight training and skill-development things he had been doing. It sounded like an exciting place to play and grow and I have to admit, I was a bit envious when comparing Tim’s college baseball experience to mine. After another uninspiring season at Erskine, I told my coach I would not be coming back and wrote a letter the Coach Chal Port. He wrote me back and said that while he couldn’t guarantee me a spot on the team, and he didn’t have any scholarship money available, I was welcome to transfer and try out as a walk-on. In retrospect, that wasn’t exactly a vote of confidence, but at the time I felt like Jim Carey in Dumb and Dumber. Heck, that was all I was asking for, so I made the leap. The Citadel Baseball team was good. There were lots of talented players on the squad. When workouts began, I looked around and it was difficult to see where I might fit in. My buddy, Tim had moved over to shortstop and would go on to become an All-American. Drafted in the second round by The St. Louis Cardinals, he would play for 6 years in the big leagues, backing up some ancient dude named Ozzie Smith. Every other infield position was 2-3 deep in guys that looked like better players than I. My mind began to wonder if I had made a colossal mistake — if I would ever be able to crack the lineup. Those doubts were amplified and ignited like a backdraft fire about three weeks into our first fall practices. Coach Port was as “old school” as they came and he would verbally rip you for a mistake at the drop of a hat. If you want to play for Coach Port, you had to give a full effort and be completely engaged every second of every practice and game, and you had to have a tough skin. The veteran players had warned me that the old guy was pretty harsh, but I wasn’t overly concerned. I had always been the kind of player who hustles relentlessly, and as such, I had never had any trouble with a coach. When he said it, I didn’t really know how to respond. I left my position and wandered into the outfield, trying to stay out of the way. I drifted to an empty space behind third base about 10 feet from the left field foul line. “GET OFF THE F***ING FIELD! I shuffled to a place outside the foul line. I stood facing the field with my toes 3 inches in foul territory. And, there I remained, like a statue for the rest of the practice. Coach Port never said another word to me, or even looked my way for the entire day. When practice was over, I raked the field, showered and went back to my barracks. I went to bed praying that the next day would be better and that I’d start to figure some things out. Coach Port was indeed very organized, and unlike the rag-tag practices we had at Erskine, he had every day scripted to the minute. From batting practice pitchers, to bucket duties, to field maintenance, everyone had a job every second of every workout. Each day the practice schedule was posted on the bulletin board in the locker room. You were expected to know exactly where to be and what to do at all times. When a drill changed, Coach Port would blow a whistle, and you were required to sprint to your next station and start working on whatever you had been assigned to do. Some guys would take notes on index cards and stuff them in their hats to be sure they didn’t screw it up. The day after my humiliating ejection from practice, I got to the locker room early and checked the bulletin board for the day’s plan. My name was not listed. Disappointed, I assumed I was still banished from the field, so when practice started, I took up my post in left field foul territory. Coach Port made eye contact with me … and said nothing. Again, I stood there, without moving my feet an inch, for the entire practice. By the next day, I was 100% certain that I had indeed screwed up royally by enrolling at The Citadel. For the second consecutive day, my name was not on the practice schedule, so I parked myself on in the same place, on the same footprints, just outside the foul line. One thing I had grown to like in the first three weeks was The Citadel’s approach to batting practice. Instead of taking the wasteful 40-40-40 traditional batting practice (40 year old guy, throwing 40 mph from 40 ft), all of the hitters faced live, competitive pitchers every day. It was usually the freshman pitchers who didn’t see a lot of action that were responsible for throwing live batting practice. They threw from 60’6″, and they were always nervous. On this day, he was relentlessly hounding them at a level I hadn’t seen yet. After 3 or 4 different guys had crumbled under the pressure, Coach Port bellowed, “Is their anyone on this @$%## team who can throw a strike so we can take some #$%^&* batting practice?!! In the silence of the awkwardly long pause that followed, I saw an opportunity. “I didn’t give up everything to come here and watch from the sidelines.” I thought. I had to find a way to show Coach Port that I could contribute to this team! Maybe this was my chance. Drumming up every ounce of courage I could muster, I stepped across the line and into my future. “I can do it.” I said, and I sprinted to the mound. I was not a pitcher. I was a mediocre infielder with a weak arm. I had never thrown batting practice before in my life. Nonetheless, even though things had not gone well up to this point, I saw a sliver of hope. As I held the ball in my hand, a wave of anxiety rushed over me and threatened to derail the plan. I took a deep breath, rocked backward, stepped toward home plate, and threw the ball as hard as I could. It split the heart of the plate and popped the catcher’s mitt. From there, it became automatic. For the next hour, I stood out there pumping strikes. Lots of them. I thought about absolutely nothing except laser locking in on the catcher and found a zone. After every pitch, my only thought was the next pitch. When I looked up, batting practice was over, and I had thrown to every guy on the team. Coach Port never said a word. Mine was the only name on the list. So, I found a role. I threw live BP for the rest of the fall—every day. I showed up before every practice to get my own work in and then threw BP, as hard as I could, to every player on the team. In the spring I made the traveling squad — sort of. My role: Batting practice pitcher and scorebook keeper. I never viewed my BP pitching job as a chore. To me, it was an opportunity to improve my arm strength. In my estimation, I threw over 400 pitches per day, every day. All were from actual game distance, and I threw every ball as hard as I could. If the hitters complained or asked me to take a little off, I threw harder. Unquestionably, this was not the safest way to improve arm strength, My arm was sore every day, but I still threw. And, as you might expect, what had been my most significant deficit — my throwing ability was now becoming a legitimate strength. The next fall, I was eligible to play, but I still wasn’t sure if I would be able to crack the starting lineup. I knew I could hit a little, but with returning starters at every infield position, I didn’t know if there would be a place for me. As fate would have it, our starting catcher had knee surgery and moved to first base. I was playing second base during an intrasquad, and with a runner on 3rd, I went into shallow right field to catch a flared popup. When I made the catch, my momentum was carrying me further into the outfield, so the runner tagged. I planted my back foot and threw a frozen rope to home plate, ringing him up by 3 steps. Everyone on the field (including me), was shocked by my newfound rocket arm. My eyes widened. I had never caught before, but again, I saw an opportunity. That spring, on opening day against Clemson, I was the starting catcher, a position I held for the next 2 seasons. At The Florida Baseball Ranch®, we tell our guys every day that uncommon achievement demands uncommon thought, and uncommon action. Leaving Erskine College and transferring TO The Citadel as a walk-on was certainly uncommon. I’m not sure, but I might be the only 3rd-year baseball player in history to transfer INTO The Citadel. Lots of guys transfer OUT. Almost nobody transfers IN. Looking back on it, the decision to transfer INTO the Citadel to play baseball was a little like volunteering to go to prison because of the excellent meal plan. It was an unquestionably an uncommon move. And although it didn’t start out well, that move has produced dozens of uncommonly favorable outcomes that have altered the course of my life. At Erskine, I had been an average student, but under the discipline of the military structure at The Citadel, my grades improved. After one semester, I was offered and accepted a full Air Force ROTC scholarship, relieving my dear widowed mother of the burden of paying for my education. Upon graduation, I entered the United States Air Force where, after five years as a Nuclear Missile Launch Officer, I was accepted into The US Army-Baylor University Graduate Program in Physical Therapy. Having fulfilled all my contractual obligations during ten years of service, my family and I settled in the suburbs of Tampa and opened a private physical therapy practice that has thrived for 26 years. We raised 3 incredible young men, who have been my life’s greatest joy. Each grew to share my passion for baseball and allowed me the privilege of coaching them as they ascended to the collegiate level. 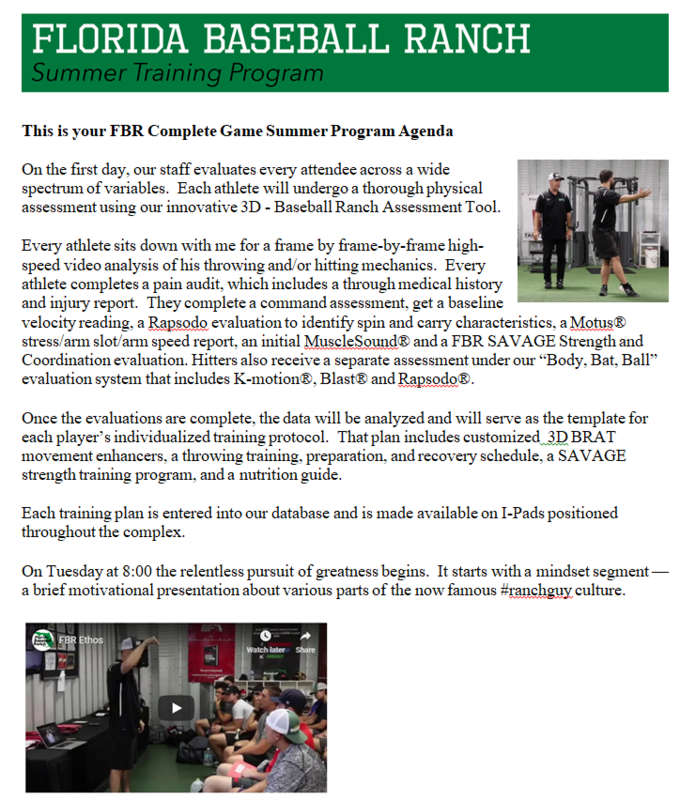 Our uncommon collective quest for improvement eventually guided us to The Texas Baseball Ranch®, where a friendship with Ron and Jill Wolforth led the realization of my wildest dreams in the form of The Florida Baseball Ranch®. Oh. And I had a pretty good run with the whole college baseball thing myself. Sitting in the dugout next to Coach Port for an entire season, I learned more about the game and about coaching than I could have ever imagined. I compiled a 2-year career batting average of .352 and, as a senior I was named as a first-team CoSida GTE Academic All-American — an honor I still hold with pride 35 years later. I often reflect upon that pivotal day — the day a single thought, a desperate grab for relevance that literally came out of left field — the day four simple words changed the course of my life forever. And, there’s no reason you can’t be just like them. Mealy-mouthed pessimists and skeptics will tell you it’s impossible. They’ll try to make you believe you don’t have what it takes. They’ll show you what I call the “pyramid of hopelessness” and urge you to give up on your dream. Most people would look at the pyramid, nod in agreement, and quit. If you think you have what it takes to be a Ranch Guy,take the uncommon step to believe there is greatness in your future and click here. Get signed up for one of our SAVAGE Throwing or Hitting Camps. Or, call us at 813-503-5145 and let us customize a plan to get you where you want to be. Your first step to greatness is only a click away.